This is an amazing story and a very timely one in these last days. How awesome is it that THE Angel of the Lord came in person and visited Gideon; even called him, ”A mighty man of valor!” You would think that he’s off to a pretty good start, until he started going through a whole laundry list of complaints. All names in the Bible have meaning. Notice that the Bible calls this Visitor, “THE ANGEL of the LORD.” It wasn’t Gabriel and it wasn’t Michael. 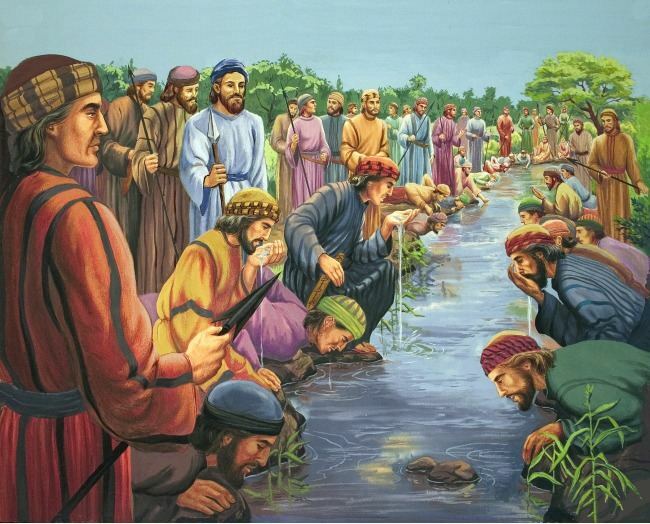 It was Jesus Himself in a pre-incarnate appearance….and Gideon was whining and complaining to Him. I’m sure you noticed the names in bold font in the opening passage. Their meanings add a depth and understanding to the text you would never get simply by reading through the story. For those of you who don’t know, there are 4 levels of Bible study according to the Jewish rabbis. For more on that topic, please follow the link below: https://emmausroadministries.wordpress.com/2016/06/26/eutychus-the-story-behind-the-words/. The names in this story tell us about Jesus and how he defeated our enemies at the cross! The three mentioned in the opening scripture point to the Trinity. “Joash (Ya-esh)” literally means “God Fire.” Who is like a burning fire? The Father! “Abiezer (Av-ezer)” means “Father Help,” literally. Who is that? The Holy Spirit, the Helper! And you already know that “The Angel of the Lord,” is Jesus! That’s quite a list of woes. Kinda sounds like us at times when nothing seems to be going right and everyone is against you. It’s depressing and discouraging. Wait, what? “Go in your might?” You mean full-of-complaints, scared-to-death Gideon, the man who admitted to being a weakling…..that “might?” Yep, Gideon the weakling, scaredy cat. But that’s just like our God, isn’t it! He gives us the grace to do the things He asks of us, we do those things, then He turns around and gives us the credit for using the grace He gave us to do what we did! Don’t think for one minute it’s you, though. What better offer could he get? But it still wasn’t quite enough to convince Gideon. You can see he was still focused on himself, not God…..yet! So, he asked the LORD if he might test and see if he was really the man for the job, hence the famous story of the fleece that he laid before the Lord…..twice! Every time Israel got herself in trouble, it always started when she left the God of her fathers and began worshiping other gods. It was a destructive pattern they repeated a number of times. After each indiscretion, eventually they would cry out to God, and He invariably would send them a deliverer in the form of one of the Judges. (For more on the topic of Israel’s indiscretions, please follow the link below. It demonstrates how God really sees things! Just before Gideon took over as one of them, Israel had once again gotten herself into another bind. This time she was being oppressed by the Midianites. There was such a great horde of them they could not be numbered! Hebrew is a language of picture writing, like Chinese. Each letter is a picture of something. Gideon’s name means, “One who hewed down (the enemy. )” Apt description! [ג] Gimel is a picture of a camel, a form of transportation. [ד] Dalet is a picture of a door. The “Door” is Jesus! [ע] Ayin is a picture of the eye. [ו] Vav is a picture of a nail or hook, depicting Jesus’ sacrifice when He was “nailed” to the cross. [ן] Nun is a picture of a fish which depicts believers. The Message In His Name. Gideon wasn’t God’s man because he was anything special in and of himself. The “pictures” that the letters of his name tell us is this: Gideon was a man who had “TRAVELED through the DOOR, who SAW the SACRIFICE ON THE CROSS and believed. He became a BELIEVER! When you trust in Jesus, He goes before you and “Hews down the enemy” for you…..and gives you the credit! Don’t think for one minute it’s you, though. Give Jesus all the glory! Gideon started out with 32,000 men. But God said that there were too many. WHAT?! Is He aware how many enemies they faced? The Midianites were so numerous, they couldn’t be counted! That’s quite a tide of evil! His situation is not unlike what we are facing in America today. We saw it in the election of 2016 as huge tide of evil rose up and tried to prevent President Trump from being elected. THEY FAILED. We continue to see our President being used by God to turn back the tide of evil that has come FROM THE PIT OF HELL. He is facing obstacle after obstacle resisting God’s agenda. These evil people imagine a vain thing: BUT HE WHO SITS IN THE HEAVENS LAUGHS at all the schemes of the devil and his minions. If the Midianites, or “Media-nites” as I like to call them, were so numerous, why did the LORD say there were too many Israelites? Let’s follow the story. God Weeds Out The Fearful. Anyone who was “fearful and afraid” was told to turn and depart at once from Mount Gilead. The root word in Hebrew for “Gilead,” is the verb, “Galal,” which means, “to roll some object on, upon or away.” Figuratively, it carries the idea of rolling oneself onto the Lord. The men who were afraid did not have great faith or trust in the Lord, hence their fear. 300. That’s the number at which God was aiming. Finally He reached a number He could use to defeat this innumerable horde, bring great glory to His Name, and BLESS HIS PEOPLE!!! 300 just happens to be the number of VICTORY! Bear in mind, this is NOT numerology or some other superstitious nonsense. See what I mean? How can a mere man go up against such a formidable, innumerable army of people? Pretty intimidating! But God knew that there might still be just a “little bit” of fear on Gideon’s part (Ya think!? ), so He told him to take his servant and sneak down into the camp of Midian. There, they would overhear something that would totally turn the tide and encourage them. The Importance Of The Shofar. The Hebrew word for “trumpet” here is literally, “Shofar.” Do you know what a Shofar is? A ram’s horn which you get BY KILLING A MALE LAMB. It brings to God’s remembrance of the death of Jesus! It is said that demons tremble and flee in terror at the sounding of the Shofar. Well, as we shall soon see, indeed they did flee…..IN ABJECT TERROR! This whole scene occurred just as one watch was coming off duty and the next one was coming on at the darkest time of the night. The guys who were coming off shift were really tired and the ones coming on duty were just waking up, most likely still not fully awake. When it’s REALLY dark, even the tiniest light can be seen for miles. Well, imagine the confusion when, all of a sudden, you see your encampment surrounded by torch lights, presumably from a great army, and you hear shouting and Shofar blasts all around you! What do you do? And that’s exactly what they did! They were so freaked out they either started killing each other in their confusion or fleeing in terror, leaving behind everything they owned. 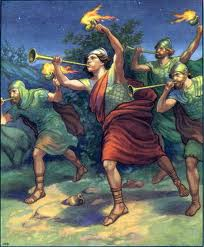 “When the three hundred blew the trumpets, the Lord set every man’s sword against his companion throughout the whole camp; and the army fled to Beth Acacia, toward Zererah, as far as the border of Abel Meholah, by Tabbath. 24 Then Gideon sent messengers throughout all the mountains of Ephraim, saying, “Come down against the Midianites, and seize from them the watering places as far as Beth Barah and the Jordan.” Then all the men of Ephraim gathered together and seized the watering places as far as Beth Barah and the Jordan. 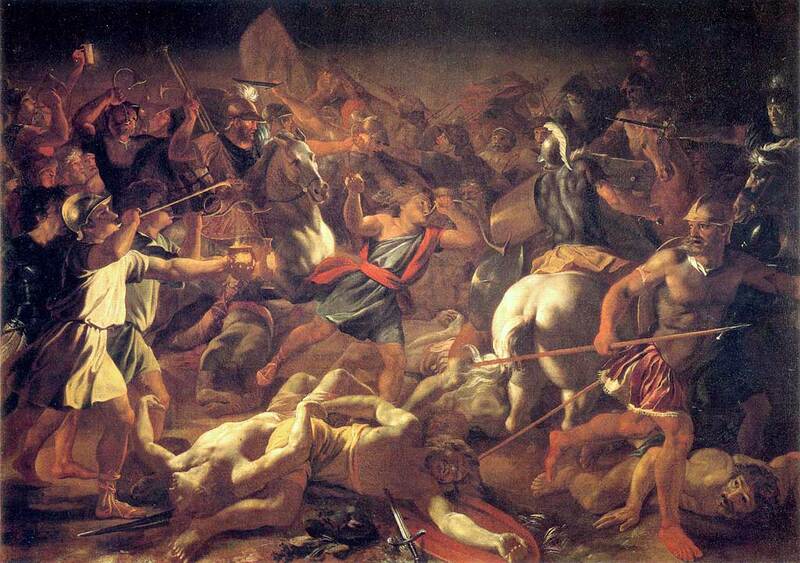 25 And they captured two princes of the Midianites, Oreb and Zeeb. 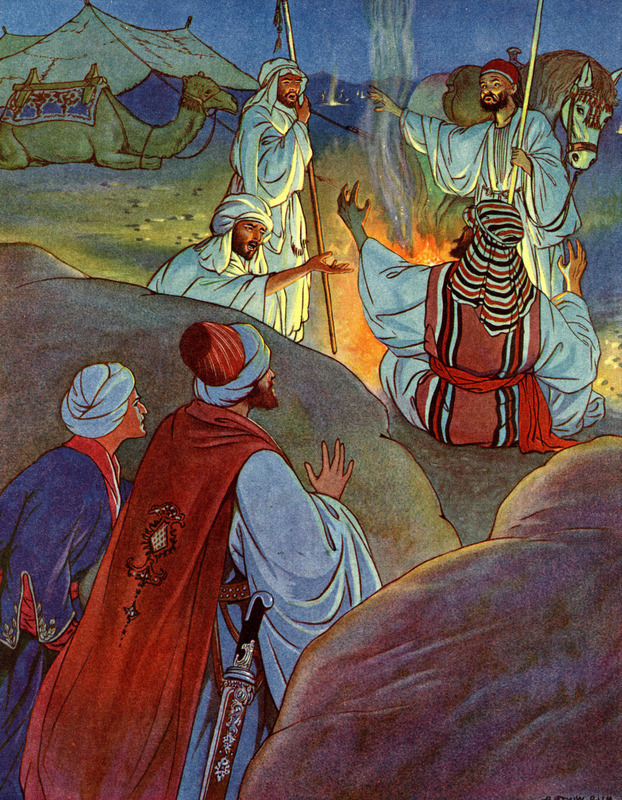 They killed Oreb at the rock of Oreb, and Zeeb they killed at the winepress of Zeeb. They pursued Midian and brought the heads of Oreb and Zeeb to Gideon on the other side of the Jordan. Now it was time to recall everyone who had been weeded out prior to this rout to come and join the fight. More Secrets In The Hebrew Language. The name, “Midian,” means “Strife.” Oreb and Zeeb are also very telling. “Oreb,” comes from the root word that means “evening: Erev.” The other name, “Zeeb,” means “wolf.” What do wolves go after? SHEEP! In the last days (the “evening”)…..you know, like NOW…..there will be ravening wolves that go around looking to devour the sheep of God’s pasture: The Church.” But our “300,” few by comparison to the number of “Midianites,” (or as I like to call them, “the Media-nites,”) will shout and lift up the Name that is above EVERY name: JESUS! He will fight for us and we will be completely victorious over the enemies that have sought to steal, kill and destroy. God will restore to us everything the enemy has taken from us! So Church, earthen vessels containing the Light of God, let your light shine, no matter how dim it may seem to you. Shine through the darkness of this fallen world. Sound the Shofar by lifting up the name of Jesus! The enemy has to flee when he hears it! Righteousness will again rule our land as we will follow Jesus, the Greater Gideon. The Battle belongs to the LORD, just as here, in the story of Gideon’s 300!